Kami Magee (middle) attained her 500th assist at the Spike and Dig Tournament in Hillsboro on August 18th. She was honored last night at our home volleyball game. Kami was presented a commemorative ball prior to the start of the varsity game. Kami is a senior at Fairfield and has played volleyball all four years. Kami is the daughter of Eric and Tonya Magee. The varsity team has accomplished several firsts already this season. The Lady Lions won the Spike and Dig Tourney. The Lady Lions also handed North Adams their first league loss in five years on Tuesday August 28. Kami Magee (middle) attained her 500th assist at the Spike and Dig Tournament in Hillsboro on August 18th. She was honored last night at our home volleyball game. Kami was presented a commemorative ball prior to the start of the varsity game. Kami is a senior at Fairfield and has played volleyball all four years. Kami is the daughter of Eric and Tonya Magee. The varsity team has accomplished several firsts already this season. The Lady Lions won the Spike and Dig Tourney. 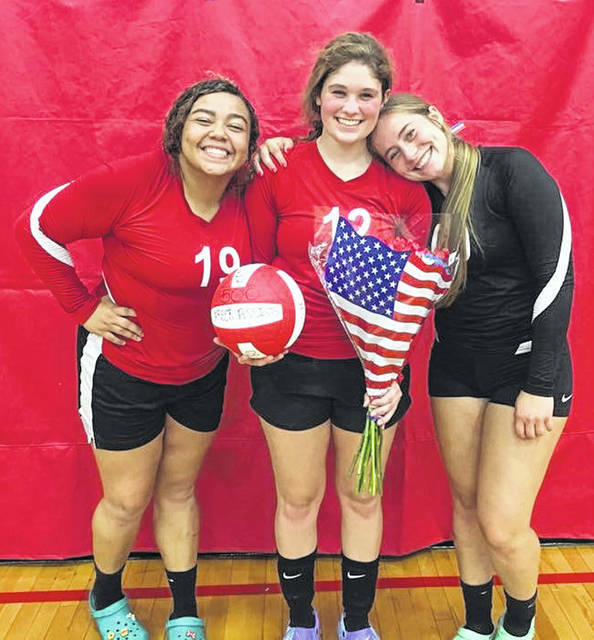 The Lady Lions also handed North Adams their first league loss in five years on Tuesday August 28.
https://www.timesgazette.com/wp-content/uploads/sites/33/2018/08/web1_Kami-Magee-with-White-and-Arnold.jpgKami Magee (middle) attained her 500th assist at the Spike and Dig Tournament in Hillsboro on August 18th. She was honored last night at our home volleyball game. Kami was presented a commemorative ball prior to the start of the varsity game. Kami is a senior at Fairfield and has played volleyball all four years. Kami is the daughter of Eric and Tonya Magee. The varsity team has accomplished several firsts already this season. The Lady Lions won the Spike and Dig Tourney. The Lady Lions also handed North Adams their first league loss in five years on Tuesday August 28.